Calender, Ebenezer, noted Sierra Leonean guitarist and singer; b. Freetown, 1912; d. Freetown, 1985. Calender was born among the Krio people—descendants of freed slaves of various ethnicities repatriated to Africa at the colony of Freetown—to a West Indian father and a Krio mother. While still a schoolboy, he began playing music in a goombay band, so named for its lead drum whose player was usually accompanied by others playing triangle, carpenters saw, and bass box (a large wooden box used for shipping beer bottles). 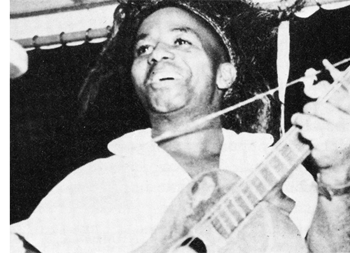 Calender taught himself to play guitar, and although he took up coffin making as a profession, he emerged in the years following World War II as the leading performer of maringa music. The name was variously said to be a corruption of merengue or merry-go-round, while the music itself was a close cousin to calypso. Maringa bands played weddings and funerals but were heard more often marching along Freetown’s streets. Guitar, banjo, or mandolin anchored a typical group, accompanied by trumpet or flute, small drums, and a tuba or bass box. Calender made his first recordings for Decca when the British company came to Freetown with a mobile studio following the war. Subsequent recordings on HMV and the local Bassophone label sustained his popularity. With songs like “The Stolen Chicken,” “Double Decker Buses,” and “You Eat Me Money, You Say You Nor Want Me,” Calender chronicled life in the colony as it made the transition to independent Sierra Leone. His most famous song, “Fire, Fire, Fire,” was a hit along the West African coast as far east as Nigeria and was covered by a number of other musicians. Following independence Calender worked as a program officer for the Sierra Leone Broadcasting Service where he also had his own radio show. Opportunities for recording diminished as Sierra Leone’s economy underwent a slow disintegration, but Calender continued to play for parties and on the radio right up to the time of his death. Calender’s popularity was mostly limited to the confines of Sierra Leone, and Freetown in particular. His passing was perhaps the death knell for the Krio culture that had flourished there during the nineteenth and early twentieth centuries. The independence era triggered a reduction in Krio political power, and the subsequent unraveling of the country’s economy brought declines in education and commerce, areas where the Krios also excelled. Civil war in the 1990s all but ended the cultural life of the country, and no successor to the likes of Calender has appeared. Sierra Leone Music: West African Gramophone Records Recorded at Freetown in the 50s and Early 60s (Zensor ZS 41) 1988; African Elegant (Original Music OMCD015) fifties recordings reissued 1992. N. Ware, “Popular Music and African Identity in Freetown, Sierra Leone,” Eight Urban Musical Cultures: Tradition and Change (Urbana, Illinois, 1978); Songs by E.C. (Bayreuth, 1984); E. Calender, Krio Songs (Freetown, 1985); W. Bender, “E. C. - An Appraisal” Bayreuth African Studies Series (no. 9, Bayreuth, 1989); G. Stewart, "The Music of Seirra Leone," The Beat (vol. 12, no. 1, 1993).